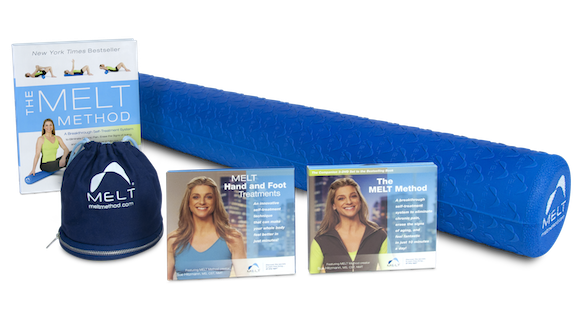 The MELT Roller Bundle includes the Soft Body Roller and the 3-disc MELT Method DVD. The MELT Method Soft Roller is the only roller developed for the techniques of the MELT Method, offering gentle compression without unnecessary discomfort. These techniques rehydrate connective tissue, rebalance the nervous system, promote healing, reduce inflammation, decompress the neck and low back, improve core stability, mobilize joints, stimulate organ function, increase flexibility, and much more. The latex-free roller is 36 inches long and 5 inches across. 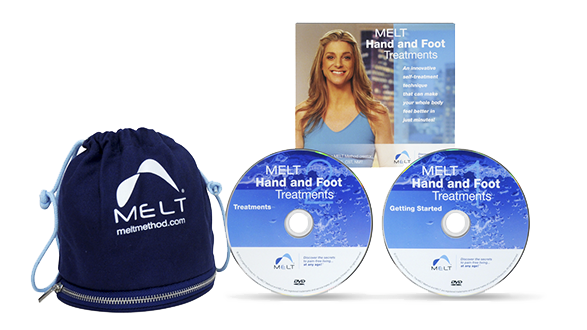 The MELT Method DVD walks you through the sequences and moves in the bestselling MELT Method book. The set includes 3 discs (over 4 hours), including step-by-step tutorials, 8 mix-and-match sequences, and 3 full classes that you can take with MELT creator Sue Hitzmann in the comfort of your own home. Plus a 16-page illustrated Getting Started Guide, including a Getting Started Quick Start Guide, the Getting Started Self-Treatment Plan, and Special Circumstances Self-Treatment Plans, for help making MELT part of your self-care plan when you’re healing, managing a diagnosed condition, or pregnant or postpartum.